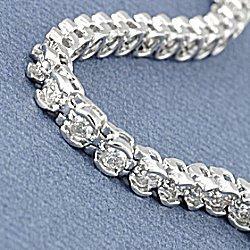 Classic and elegant, diamond tennis bracelets are the jewelry equivalent of the little black dress. Suitable for a range of wardrobes and special occasions, their versatility makes them an excellent addition to any woman's jewelry box. What are Diamond Tennis Bracelets? Originally called eternity bracelets, these delicate bracelets got their sporty name from world championship tennis player Chris Evert, who wore one during the 1987 U.S. Open. During one of her games, the bracelet broke, and the match was paused while she could recover it. Thus the name "tennis bracelet" was coined, and the bracelets' popularity quickly increased because of this unintentional publicity. 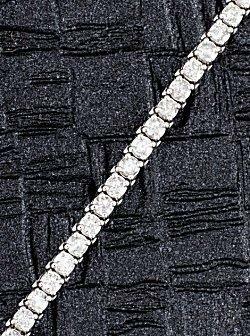 There are several defining characteristics of diamond tennis bracelets. They consist of small gems strung in symmetrical, continuous links along a narrow, flexible chain with no charms or other add-on embellishments. Generally speaking, there should be more gem than metal visible, similar to a pave setting engagement ring. Different jewelers, however, define bracelets differently, and any design that utilizes a repeating pattern of diamonds and metal may be called a tennis bracelet. Stone Shape: Round diamonds are by far the most popular, though emerald and princess cuts can also be used. Some bracelets will alternate shapes for additional distinction. Stone Choice: Naturally, diamonds are the preferred gemstone for tennis bracelets, but many styles may incorporate birthstones or other semi-precious gems for color and customization. Type of Metal: Yellow and white gold are the most popular metals used for bracelets, though alternative types of gold (rose, sage) may be found as well. Platinum is often used for very heavy, valuable bracelets because it is more secure. Stone Setting: Simple four-prong settings are the most common choice because they minimize the visible metal and accentuate the stones. Other options include full and partial bezel settings, channel settings in wide "links," or more elaborate designs such as flush settings in metal teardrops or figural arrangements. Some of the most popular styles of diamond tennis bracelets position bars of metal between each stone in any number of shapes, from straight or S-shaped bars to delicate swirls or meaningful X-shapes, giving the piece a fun "hugs-and-kisses" theme with the stones providing the O's. The bracelet's final cost depends primarily on the total carat weight of the diamonds. A very thin, narrow bracelet may use only one-quarter carat of stones, while a heavy bracelet may weigh up to four carats. Several jewelers do offer heavier versions, up to seven carats or more, for substantially higher prices. Most bracelets cost between $200 and $5,000. The quality of the diamonds also affects the final price. Certified stones typically cost more, though a very heavy bracelet with lower quality stones may be less expensive than a light bracelet with colorless, flawless diamonds. Colored diamonds may also be used for a rare and distinctive piece, though the price will be notably higher. 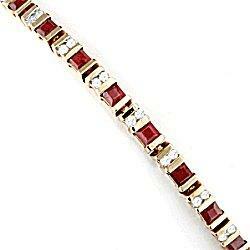 Diamond and gemstone tennis bracelet. To find more affordable diamond tennis bracelets, look for designs that utilize smaller stones with creative metal patterns between them such as infinity links or elongated ovals or bars. This lowers the carat weight of the bracelet without destroying its symmetry and beauty. Other options include using synthetic or imitation diamonds such as cubic zirconia or moissanite, or choosing lower quality diamonds that may not show any visible difference to an untrained eye. Adding colored gems is another way to lower the cost of the ring without sacrificing its defining characteristics. Classic and elegant, diamond bracelets make stunning anniversary, birthday, and holiday gifts for women of all ages. They are also beautiful engagement gifts, either from parents to their daughter or from a groom to his bride-to-be, perhaps to wear on the wedding day. When giving a bracelet as a gift, note that the most common length is seven inches - this will fit all but the largest and smallest wrists. If a special size may be needed, consult a jeweler before making a purchase. All diamond jewelry requires meticulous care to look its best, and bracelets are no exception. Store them away from other pieces to prevent accidental damage, and clean them carefully with a soft cloth to maintain their brilliance. Periodically inspect the clasp - claw and box clasps are the most common - to be sure it is secure. If any stones are lost and repairs are necessary, bring the piece to a qualified jeweler. With classic glitter and elegant flair, diamond tennis bracelets are a stunning addition to any jewelry collection. From narrow, delicate bands to heavier, more elaborate designs, there is a wide range of options to suit any budget and style with this beautiful accessory.